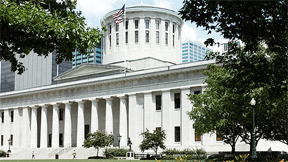 The Honorable Eric Brown, Judge of the Franklin County Probate Court, will be sworn in as Chief Justice of the Supreme Court of Ohio at a public ceremony at the Ohio Statehouse. The event will include the administration of the oath of office by Justice Paul E. Pfeifer and remarks by Judge Brown. On April 14, Gov. Ted Strickland named Judge Brown to the vacancy on the Supreme Court following the late Chief Justice Thomas J. Moyer's unexpected death on April 2.